Planning on a family vacation to Transylvania? Before you pack your bags and head out to find the historic vampire sites, we think it might be a good idea if your girl got a taste of what it's like to be one. No blood sucking required for this fun costumed experiment! 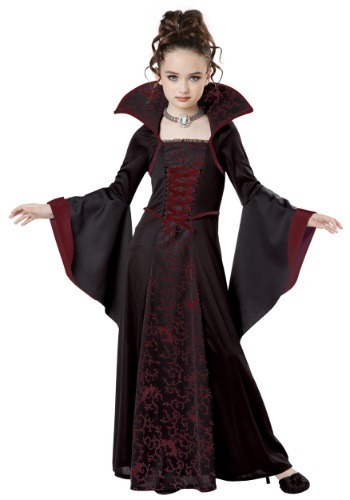 As you’re busy booking the hotel and updating passports and making a list of all the best late night cafes to visit, your kiddo can get all dolled up in this Child Royal Vampire Costume—the look of a true vampire queen. She can walk up and down your long staircase very slowly (once night has fallen, of course), admiring the feeling of this fierce dress as it trails behind her. How great that your little girl can put on this costume on and just pretend to be a vampire so that she doesn’t make the full transformation into a Nosferatu overseas (we hear the paperwork is really a bureaucratic headache). With burgundy and black color themes, this dress is likely to be packed into her travel bag, even if she has to leave all her other clothes behind just to make room! And that’s good, because this look will have her fitting in with the rest of the vampires in the neighborhoods you visit, so if you need to stop and ask directions she’ll look like a local. She might have so much fun pretending to be a vampire, that you might find yourself heading back to Transylvania sooner than you expected!